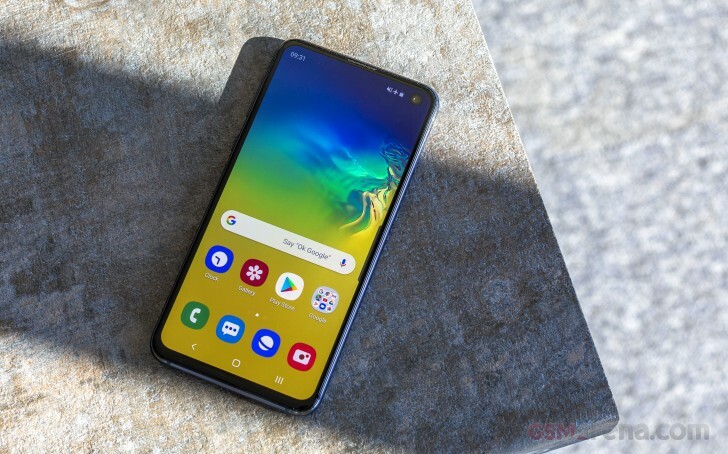 Samsung's flagship devices have always been in the top echelon in the smartphone industry when it comes to OLED panels and despite the considerably lower price of the Galaxy S10e, the company didn't cheap out with an inferior display. It's on par with its bigger and more expensive siblings in terms of overall picture quality. The only downgrade over the Galaxy S10 and S10+ is the resolution. We've got a 5.8-inch Dynamic AMOLED screen with a punch-hole camera in the upper right corner. The resolution is 1080 x 2280 pixels with a 19:9 aspect ratio. It supports the HDR10+ video standard so you can enjoy HDR10-compliant content on your phone. We ran the usual screen tests and saw some impressive digits. The maximum brightness in manual mode is just 389 cd/m2 but can go up to 803 nits in Max Auto mode. That's one of the brightest screens we've seen on a smartphone along with the Galaxy S10 proper. Expect great visibility outdoors. Color accuracy isn't the best one around in the default Vivid mode, as expected - 4.8 average dE2000. Whites are a bit blue-ish, the reds and the greens are off the chart as well. But if you choose to go with the Natural mode, you will see some significant improvement in color accuracy. It will fix the whites and all other colors by bringing down the average dE2000 down to 1.7. A deviation so low that it's virtually impossible to spot with a naked eye. Since the Galaxy S10e is the smallest of the bunch, it's only natural to offer smaller battery. The 3,100 mAh unit inside may not sound much but it was able to squeeze out more than decent runtimes. The video playback time and the standby scores were the ones that boosted the overall endurance score to 83. That's a pretty good score given the capacity and it outperforms the vanilla Galaxy S10 in this regard. However, the Galaxy S10+ still comes out on top as the 4,100 mAh battery. Our battery tests were automated thanks to SmartViser, using its viSer App. 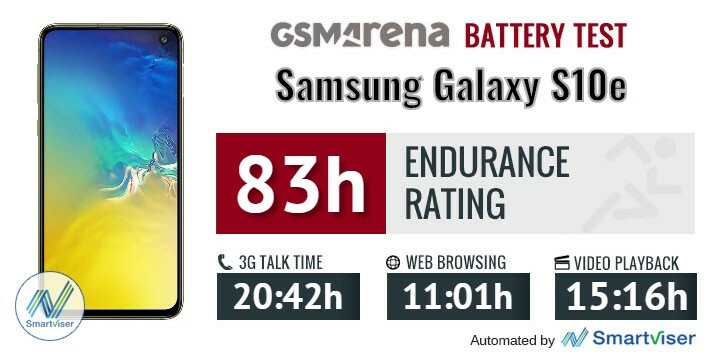 The endurance rating above denotes how long a single battery charge will last you if you use the Samsung Galaxy S10e for an hour each of telephony, web browsing, and video playback daily. We've established this usage pattern so that our battery results are comparable across devices in the most common day-to-day tasks. The battery testing procedure is described in detail in case you're interested in the nitty-gritty. You can check out our complete battery test table, where you can see how all of the smartphones we've tested will compare under your own typical use. Unfortunately, just like the rest of the Galaxies, the charging speeds over the Adaptive Fast Charging protocol aren't all that impressive for a 2019 flagship. It took us 30 minutes to charge the phone to 36% with the included 15W charger in the box. Quite underwhelming. Perhaps the additional battery charging features could make up for the lack of fast charging? For example, the phone supports wireless charging and can charge other devices wirelessly as long as they support the protocol. One more thing - the handset can charge other devices wirelessly while it's being charged using the cable. This way you can charge two devices at once on a single charging brick. That's pretty neat. We've tested the feature, and it worked on other phones and couple of smartwatches here in the office. But to be honest, the reverse wireless charging feature would probably come in handy only when you are in dire need of charging your smart wearable. The charging method is ineffective. It drains the battery faster than it could charge the other device and it heats up quite a bit. Just like the big boys, the Galaxy S10e uses stereo speakers - one hiding at the bottom side behind the grille next to the USB-C connector and the other one doubles as an earpiece. The sound coming from both of them is loud enough, and you will probably hear them ringing just fine in a loud environment. Sound quality is also pretty impressive. Subjectively speaking, they sound full, clear and there's noticeable bass. You can even feel the back of the phone vibrating when listening to music, for example. Our only complaint would be the lack of balance. The bottom-firing speaker is noticeably louder than the one in the earpiece. The Samsung Galaxy S10e had the same excellently clean output as the two more expensive members of the S10 series. Its readings were perfect when hooked to an active external amplifier and headphones didn’t do any notable damage either. The differences between the three Galaxy S10 phones come down to loudness - the plus version had super high volume, the vanilla S10 was well above average, and now, the S10e is the quietest of the three. It sits just above the 50 percentile, which means it’s going to work just as well as the other two for the vast majority of users, but may end up out of its depth if you have particularly high-impedance headphones and a taste for very loud music.